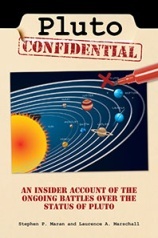 Pluto Confidential tackles the controversial decision of the International Astronomical Union (IAU) to exclude Pluto from the category of planets, presenting the arguments from both perspectives. In the book two astronomers - Marschall and Maran - detail how something as seemingly esoteric as a scientific classification could spark an international furore. Never had the media spotlight shone so brightly on the astronomy community as when the IAU's 2006 decision captured the imagination of so many. The book explains why a definition was thought to be needed, explores the bubbling debate on Pluto and tells the reader what finally precipitated the IAU vote. The authors show how despite Pluto being discovered as far back as 1930, its true nature only began to be revealed over decades of research by which stage its status as a planet was firmly entrenched in the public consciousness. Besides the Pluto story, what Marschall and Maran ultimately bring to our attention is that astronomers are human, subject to the same motivations and pressures as the rest of us. They achieve this by focusing a large part of the book on some past astronomical disputes surrounding, for example, the naming of Uranus, the discovery of Neptune and the vain search for Vulcan. Although these are well-worn narratives, the authors infuse their re-telling with vivid accounts of the personalities involved and their interactions with each other, showing how this both helped and hindered scientific progress. So, though astronomers may aspire to impartiality and dispassionate assessment of the facts in conducting scientific research, they sometimes fall short of these laudable aspirations, as the recounting of key events in this book so viscerally demonstrates. The level of scientific detail increases towards the latter part of the book (e.g. : the chapter on Exoplanets) but was not overwhelming for the casual reader and provides enough information to satisfy most. For those who are interested in more detail the book has a very useful collection of sources for each chapter. Overall, this is a highly readable book which engages, without overpowering, the reader. The platform for the authors' opposing views on Pluto's status in the final chapter provides a calm reasoned exploration of the arguments. This is a neat conclusion to a book which opened describing the near-hysterical reactions to the IAU decision.